Ray Turner: Population is an ongoing exhibition that features an ever-expanding series of portraits by California artist Ray Turner. Bringing Turner’s work to Ohio allows the Akron Art Museum to showcase a captivating mode of painting that is simultaneously familiar and new while also celebrating the people who make up our community. The exhibition will be on view March 3 – May 27 in the museum’s Judith Bear Isroff Gallery. In September 2011, the artist visited Akron to photograph people from the University Park neighborhood. The Akron Art Museum worked with University Park Alliance, a non-profit community development organization, to identify portrait sitters whose community engagement deserved recognition. While 14 sitters were pre-selected, Turner’s energy and enthusiasm for Akron and the people he met led him to paint 23 portraits. Just as Akron has the opportunity to present portraits from other communities, the citizens immortalized in portraiture will travel on to other institutions, the next one being the Whatcom Museum in Bellingham, Washington. Including the portraits of Akronites, the exhibition comprises 190 paintings from the Population series, as well as a number of more abstracted works that demonstrate the artist’s conceptual approach to depicting the human face. The Population works will be arranged in a grid, with the center row featuring Akron portraits. Turner prefers not to identify individual works, so this center line distinguishes Akronites but keeps the portraits anonymous in order to bring a communal portrait of humanity into focus. Many of the works are unframed and are mounted directly to the wall over squares of paint in a range of hues. The color scheme differs with each installation, making each presentation of Population unique. While the geometry of the installation as a whole unites the subjects, the expressive style of the paintings emphasizes their individuality. Viewers are invited to examine identity from an individual and collective standpoint. Because Turner typically begins a portrait anywhere from a week to a month after meeting and photographing the subject, his initial impression is sometimes magnified, distorted or simply imagined. Above all, Turner paints those aspects of a person that resonate with him, knowing that his portraits are as much his own projection as they are a likeness of the sitter. 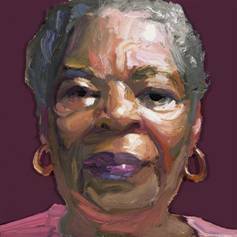 This collaboration between artist and sitter results in richly evocative portraits that speak to the way we relate to the people in our community. Unlike the portraits of Akronites, the four works from the Good Man/Bad Man series are imaginary portraits. Freed from the limits of representation, the artist pushes the genre of portraiture toward extremes of abstraction and subjectivity. These works highlight painterly gesture and experiment with texture and form. The nine works from the Monroe series all represent the artist’s son, Variations in color and shading shift the focus from illuminating a specific personality to evoking different moods. Displayed in a grid, this series also references illustrious predecessors ranging from Andy Warhol to Josef Albers. A native of Stockton, California, Ray Turner moved to Pasadena in 1982 to study at the Art Center College of Design, where he earned his BFA. He began teaching at the Art Center soon after graduating, a career that lasted 12 years. His work has been shown throughout Southern California as well as in San Francisco, New York, Miami, Chicago and Berlin. Celebrate the opening of two exciting new exhibitions. Experience two engrossing talks, peruse amazing artworks and socialize with artists and curators. Artist and independent curator Glen C. Davies will discuss the exhibition Stranger in Paradise: The Works of Reverend Howard Finster at 6 pm. At 7:30 pm artist Ray Turner will discuss his approach to painting in relation to the exhibition Ray Turner: Population. FREE for members and $10 for non-members. This lecture was made possible by the Lloyd L. & Louise K. Smith Memorial Foundation. Bring your family down to view and create family portraits. Art making activities will take place continuously from 12 – 4 pm in the lobby. Thirty minute portrait gallery tours will take place at 12:30 pm, 1:30 pm and 2:30 pm. Members and children 12 years and under are free. Regular gallery admission rates apply to non-member adults. Family Drop-Ins are made possible by a gift from the Dominion Foundation. Get to know the local sitters featured in Ray Turner: Population. Local business people, community organizers and artists represent some of the University Park population featured in the show. A handful of the sitters will participate in a gallery dialogue with the museum’s curatorial and education staff. This event is free, but requires gallery admission. This exhibition is organized and traveled by Curatorial Assistance Traveling Exhibitions, and sponsored by the Thrive Foundation for Youth. Its presentation in Akron is made possible by generous gifts from University Park Alliance and The Mirapaul Foundation. This entry was posted in akron, Art News, arts, cleveland, galleries, museums, ohio, shows and tagged abstracted works, akron, akron art, akron art mu, akron art museum, art news, arts quest, cleveland, exhibit, exhibition, gallery, museum, ohio, paint, population series, population works, ray turner, show, university park neighborhood. Bookmark the permalink.